SlideShare,the “YouTube for presentations,” has been focusing its efforts on becoming the premier platform for professional and business content. Today, SlideShare is going freemium with the announcement of tiered, paid plans for businesses. SlideShare lets anyone share presentations and video and also serves as a social discovery platform for users to find relevant content and connect with other members who share similar interests. SlideShare has previously offered two premium services for businesses, LeadShare and AdShare, which let users collect money from leads and ads on the platform. SlideShare’s CEO Rashmi Sinha says that these features will be folded into the tiered pro plans. While SlideShare will still offer a basic account for free, the startup will offer subscription-based pro plans starting at $19 per month. The silver plan, which is $19 per month, includes analytics and social media monitoring, SlideShare’s lead-gen feature, and the ability to turn off ads. The gold selection, which is focused towards small businesses at $49 per month, adds the ability to create a branded channel on the platform. And the platinum level, which is aimed towards enterprises at $249 per month, gives users the control to turn of comments and more. 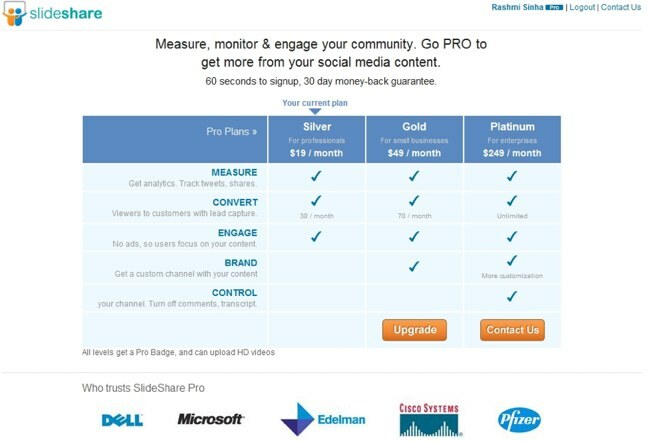 Brands such as Dell, Microsoft and Pfizer are already using SlideShare’s pro offerings. Sinha says that the startup aimed to provide a paid model similar to what professional social network LinkedIn uses for its account options. Keeping the core functionality of SlideShare was key, says Sinha, who adds that the platform is seeing 30 million uniques per month. SlideShare faces competition from Scribd, Docstoc and AuthorStream.